According to this report, "the non profit sector constitutes roughly 11 percent of the American workforce. That percentage is greater than the combined number of Americans employed by the auto and financial industries" combined. The economic downturn is "a “triple whammy” that is dealing a serious blow to nonprofit groups: fewer charitable donations from grant makers and individuals, shortfalls in state and local funds, and increased demand for social services as unemployment rates continue to climb", writes Martin Michales in this Chronicle of Philanthropy read this article. Cabrini Connections, Tutor/Mentor Connection is one of those non profit. We provide jobs. Without donations we reduce staff. We've already done that once this year. However, we also prepare kids for future jobs and careers, and help them choose positive life choices, thus, we help reduce the high costs of poverty. Furthermore, we are ready and able to add staff to do important work, like reach out to our 400 alumni and help them with job connections, or to help them form tutor/mentor programs like Cabrini Connections in their own neighborhood. We're ready and able to offer training via webnars to help people in other communities form tutor/mentor networking strategies. We just need the dollars. "Make a “handful of modest changes in the tax code” that could help counter the trend decreasing giving by individual Americans and grant makers alike. Among the suggestions: Suspend the 2-percent excise tax on foundation earnings for those grant makers who spend more than the required 5-percent payout rate; allow the estimated 65 percent of American who don’t itemize their tax deductions to claim a deduction for charitable gifts; and extend beyond this year the so-called IRA rollover that allows people ages 70½ and older to avoid taxes on withdrawals from their retirement accounts that go toward charitable gifts." If such a strategy were combined with a greater use of maps to assure that donations and volunteers were reaching non profits in all high poverty areas, or all places where help is needed, it would help keep millions of people working, help add jobs in programs that help others who are in need and suffering because of the economy, or natural disasters, or health related issues. It would help volunteer-based tutoring/mentoring programs operate in more of the places where they are needed, with the steady funding that is essential to constant improvement and long-term connections with kids and volunteers. I hope you'll read this "Quiet Crisis" and act now to implement its vision. Make a donation to a non profit today, then contact your congressman to encourage him/her to pass this legislation so this non profit you help today is still helping others tomorrow and in the coming years. You can donate to Cabrini Connections, Tutor/Mentor Connection using this form. We are writing to inform you of a mentoring study being conducted by Dr. Jean Rhodes and Dr. Janis Kupersmidt. The purpose of this study is to develop two questionnaires regarding two aspects of mentoring including (1) different motivations to mentor and (2) the expectations of volunteer mentors. Understanding these patterns of responses and their relationship to child outcomes will be useful in research on mentoring outcomes as well as in the development of mentor training programs. Moreover, these measures will be able to be used to provide individualized feedback to mentors, as well as being used to guide processes associated with mentor selection and matching. We would appreciate it if you could distribute the following email (see below) to recruit mentors in your mentoring program to participate in the study. We are especially hoping to recruit new mentors (pre-match) to the study, although all mentors are welcome to participate. Please email us at mentorsurvey@gmail.com if you have any questions. As a mentor who is 18 years of age or older, you have the opportunity to participate in a brief study about mentors' motivations, hopes, goals, fears, and expectations. The study consists of completing an online survey asking you questions about the reasons you decided to be a mentor, your expectations for your mentoring experience, and some other questions about your interests and attitudes. The survey will take approximately 30 minutes to complete. All participants who are interested will be entered into a drawing to win an iPod Touch. All of your information will be kept confidential and secure. Please contact us if you have any further questions at mentorsurvey@gmail.com. I send out an email newsletter each month to about 4,000 people. Here's the link if you'd like to read it on line or subscribe to receive it directly. "I am an Acacian. I am Proud of it." That's a pledge I took in 1964 when I joined the Acacia Fraternity at Illinois Wesleyan. Through four years of college my participation in this fraternity helped me mature as a leader, and helped me expand my ideas of social justice and the way we can influence what happens in the world. I've stayed connected to the fraternity ever since and when I formed Cabrini Connections, Tutor/Mentor Connection, two of my fraternity brothers were there to help me. Today the the email newsletter of Acacia National Fraternity included an article telling of the work I'm doing with Cabrini Connections, Tutor/Mentor Connection. They did this to help launch a collaboration between ACACIA, the T/MC and universities aimed at helping local chapters build a T/MC leadership strategy which would draw support to tutor/mentor programs in the community where each college chapter is located. An Acacia Group on our Ning site has been created. This is where we invite interested alumni and undergrads to join with us, and where we'll coach them to understand the T/MC goals, using these ideas as our strategy. If you're a member of Acacia, we encourage you to join us there. Mike Trakan created two new maps that he is showing on his blog today. One shows Metra Commuter Rail Lines leading through the city and the other shows CTA lines. On Mike's blog he emphasized how people who work in the city and live in the suburbs, or who work in the suburbs but live in the city, pass through high poverty neighborhoods every day. His message is that volunteers can use the maps to determine locations of tutor/mentor programs where they can spend a couple of hours a week enriching the life of a child, and themselves, instead of fighting traffic. I want to encourage a deeper level of thinking. The people taking the train or a CTA train through these neighborhoods are often people who lead companies, write news articles, or have been blessed with a great social network that enables them to have a house in the suburbs, or on the Gold Cost, and maybe another in Wisconsin or Michigan. These people are still working. They have jobs. They have the ability to point dollars to programs in high poverty neighborhoods. They have the ability to encourage others to be thinking of ways to help tutor/mentor programs grow in Chicago. 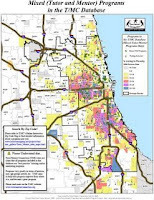 As you're reading your paper the next time and following a story like the one I keep pointing to from the 1992 Chicago SunTimes about the shooting of 7 year old Dantrel Davis, I want these people to be looking at Mikes maps, and thinking, "without operating dollars" there are no programs. Or "without advertising to attract volunteers or donors" there are no programs. 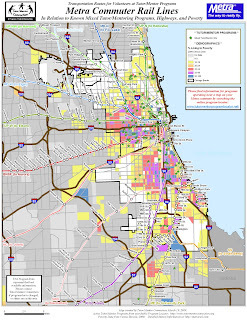 Or "why aren't there more programs in the South part of Chicago, or the suburban areas with growing poverty?" 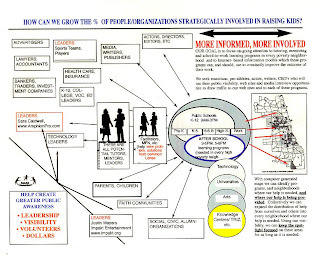 As people who can offer leadership, philanthropy, and jobs programs begin thinking of ways they might help tutor/mentor programs grow, they can use the business maps, or hospital maps, that Mike has created, or the faith group maps, to determine what neighborhoods they want to support, and what programs in those neighborhoods they want to support with annual donations that start now, and repeat each year for the next 10 years. Cabrini Connections, Tutor/Mentor Connection is one of the stories featured this month on the Oprah's Angel Network page. I hope you'll read the story, and add your own comment telling how you've been part of Cabrini Connections, or helped by the Tutor/Mentor Connection. If you're part of another tutor/mentor program, tell how it is helping you. Then, pass this link on to friends via Facebook, Linked In and other networking tools. This way you'll help us find additional donors to help fund this work and we'll be able to do more to help kids in Cabrini Connections and throughout Chicago and other cities. Visit our donor page and read our fund raising blog to see the many different way volunteers can help us raise money and support tutoring/mentoring. 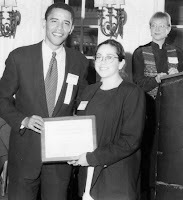 One shows President Obama in 1999 when he attended the Tutor/Mentor Leadership Conference in Chicago. 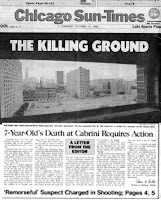 The other shows the front page of the October 1992 Chicago SunTimes, following the shooting death of Dantrel Davis in Cabrini Green. Why are there on my blog today? Because I'm disappointed that the Obama agenda does not seem to offer any new strategies for helping kids living in poverty avoid the dangers and negative influences that are common in poverty, but not common in more affluent areas. It does not reflect a commitment to increase the number of volunteer-based tutor/mentor programs, and thus the number of non-poverty adults personally connected with kids, families and schools in inner city neighborhoods. I'm a regular visitor to discussions on Fireside Learning because the topics relate to the issues important to the Tutor/Mentor Connection. In today's discussion the focus is on President Obama's Initiatives. The leader of the discussion points to articles such as this EdWeek article. I encourage you to join in these discussions. You'll see my own comments, and my disappointment that President Obama's initiatives do not seem to include any ideas on how a volunteer-based tutor/mentor program expands the network of workplace adults surrounding kids in poverty and helping them through school and into jobs. Here are some ideas he might borrow from. You can read a few of the blog articles I've written for the past few years to find many more. 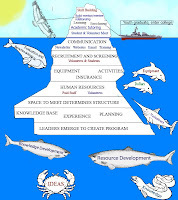 Without an understanding of how volunteer-based tutor/mentor programs expand the social capital in a poverty neighborhood, there is no way that we ever will change learning outcomes for very many inner city kids because we've not strategy to expand the range of people who are personally involved, and who give more than a random thought to long-term strategies that need to be in place in many locations if we're to reduce the violence. "beatblogging.org is an initiative of NewAssignment.Net. It looks at how journalists can use social networks and other Web tools to improve beat reporting, with an emphasis on “pushing the practice” and spotlighting innovation. NewAssignment.Net is a research project based at New York University’s Arthur L. Carter Journalism Institute and directed by professor Jay Rosen, who is on the faculty there and writes the press criticism blog, PressThink. Beatblogging.org highlights innovative beat reporters who are on their nominees list. The best of the nominees make their weekly Leaderboard feature. In this link they picked the Tutor/Mentor blog for the leader board. I invite you to visit www.jhu.edu/listeningpost/forward to read the Nonprofit “Forward Together Declaration,” view the list of signatories, and add your signature. This Declaration has already been covered in numerous news outlets including The New York Times. The Forward Together discussion board has just been launched -- now is the perfect time to share your ideas and contribute to this effort. I have signed. I posted the News Release for this Declaration on the T/MC web site. I encourage you to read the in-dept article Mike Trakan, of the Tutor/Mentor Connection, wrote in response to the strategy editorial posted this week in the Chicago SunTimes. Then read El Da'Sheon Nix's article about teamwork at Cabrini Connections. When people write about tutoring/mentoring, most are not thinking of ways to build a team of adults who will help kids in poverty move through school and into careers. If the SunTimes, and the Mayor, and Mr. Huberman, and other leaders understood how volunteer involvement in a tutor/mentor program changes the volunteer, and turns some of them into surrogate parents who do much more to help kids grow up than many of the adults in their own community, or who donate dollars, and vote for public policy initiatives, then they might invest more time thinking of how to make such programs available in more places. What happens in a tutor/mentor program? The mural on this page was created over the past few months by students and volunteers who meet at Cabrini Connections every Monday evening throughout the year. 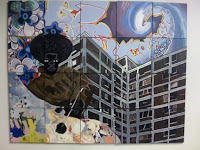 Thus mural and other art created by students and donated by professionals, will be shown and sold at our annual art festival, to be held at the Palette and Chisel Art Academy, 1012 N. Dearborn, Chicago, Il. on April 4, 2009. 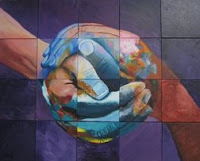 If you want to be part of our team, and help solve the problems the SunTimes is talking about, consider making a donation to support Cabrini Connections, Tutor/Mentor Connection, or come to the Art Festival and bid on this and the Peace Hands Mural, which was created last year by the art club. This is just one example of how volunteers meet weekly for a few hours. As their mentor kids to create art, they build relationships and mentor kids to aspire to be artists, or to be creative, or to aspire for a life beyond poverty. As they participate in other activities of Cabrini Connections, they meet other volunteers who try to help them build the habits and skills that enable them to achieve these aspirations. This is just one program serving a small number of kids. Programs like this need to be operating in every high poverty neighborhood and could be if this was part of the broad strategy offered by our media and public leaders. Visit the Art Festival page on our web site for more details or to make a donation. Chris Warren, who is serving a one year fellowship with Cabrini Connections, Tutor/Mentor Connection, has written a blog post showing how the T/MC seeks to work with teams from universities, professions, businesses, hospitals, etc. We have many groups growing within the Tutor/Mentor Connection Ning.com page, and our aim is to help each group adopt the ideas Chris is writing about, so that they innovate new ways to draw volunteers, operating dollars and other needed resources to constantly improving, volunteer-based tutor/mentor programs in Chicago and other cities. You can learn more about this concept in discussion posts on the T/MC main web site. As these teams form, and do their brainstorming, planning and implement their strategy via these open Ning forums, each team will learn from its own work, as well as the work of other groups focusing on the same goal in other cities. Thus, each year the impact of each team will grow based on how well the learn and innovate from the work of the entire universe of teams working toward a common goal. As these teams learn to take on the intermediary role of helping volunteer-based tutor/mentor programs get the resources needed to grow in more places, their work will model a new way of supporting the growth of needed social benefit programs, in cases where the same type of program in needed in thousands of locations. Changing the way non profits get resources will change the impact of social benefit organizations all over the world. I post images in my blogs to help communicate ideas. For instance, this one illustrates all of the work that goes on each week, and which needs to be funded, just for us to support weekly tutor/mentor sessions at Cabrini Connections each Wednesday and Thursday evening. 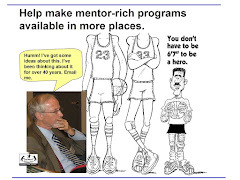 Have you ever searched Google for the words "tutor mentor" then looked at images?? I did today and there were dozens of pages with images I've put on our web sites over the past 10 years. In addition there were images from other tutor/mentor programs. I think this is a potentially great way to connect with others who may be doing similar work. I encourage you to check it out. On his Cabrini Connections Blog, El Da'Sheon Nix used a football anology to describe how we're building a team of volunteers, students and donors to help the youth at Cabrini Connections move through school and toward college and careers. On the same blog site, you can find links to blogs written by Chris and Vjeko, both of Cabrini Connections. On this blog you can find blogs written by Nicole and Mike, both with the Tutor/Mentor Connection. On this blog, and on the T/MC site you find a list of other sites where I actively network, and an even large list of blog sites that I post on our site because I think they have great information. I wish I had 72 hours in the day to read, reflect and comment on each of these. All of these groups represent a "virtual team" of people who have ideas about how to help kids living in poverty, or who are showing ways that we can work together to help tutor/mentor programs operate in high poverty neighborhoods throughout Chicago. 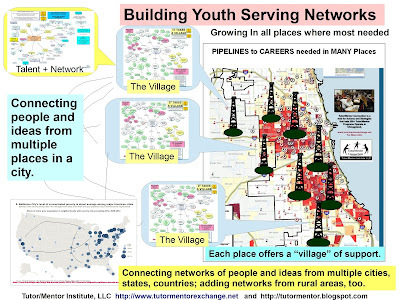 All of this information represents a "learning library" that any of us can draw from at any time, and on an ongoing basis, to support our own thinking and the way we act to help kids in economically disadvantaged neighborhoods have pipelines of support that lead them to college and careers. On the Cabrini Fund Raising blog we show how other members of the team are helping raise money for us to do this work. I hope you'll contribute to this part of the team as well as all other parts if you can.